In my city of Kamloops, British Columbia, our Kamloops Arts Council hosts a number of different painterly events throughout the year. One of them was called ‘The Small Works Show’, an annual fundraiser whereby the artist gets half the proceeds and the Arts Council gets the other half. Unlike most art shows, this one allows patrons to walk out the door with their purchase rather than wait till the event is over. No little red dots on title cards here! Participating artists are allowed up to fifteen pieces, and if/when one piece is purchased, another is immediately put in its place. So I contributed twelve paintings, and was pleased to have sold seven of them. This little piece (rather crudely photographed before being matted and framed) was given a new home, and as time goes along, I’ll post others which were also purchased. I am very grateful for the commitment and dedication of those heading up our local Kamloops Arts Council. Not far from our Kamloops, B. C., home is the village of Pritchard which used to have an original one room school occupying a corner of a farmer’s pasture–a school he himself reputedly attended as a boy–that no amount of seeking to have it lovingly restored bore any fruit with historical groups or municipalities. Fearing its derelict floors and frame would be responsible for causing trespassing children accidental injury, he reluctantly tore it all down some five years or so ago. But fortunately I managed to capture its classic image with my camera while it was still part of this farmer’s horse paddock, and I’ve painted a series of watercolours using it as a focal point. Since it no longer exists, I choose to place this old school in settings that depart rather dramatically from where it actually had been (on a rather non-descript flat field right beside Duck Range Rd). Chickadees have a gift many would love to have, which is the ability to hide seeds and other items in a large variety of places and remember each of them without a problem. Some of us come across that well-placed but unfound Christmas present for Aunt Dorothy only when moving house or doing a major Spring cleaning. They are also studied for their distinctive chick-a-dee dee call, with researchers noting that when it is a single ‘dee’ it indicates calm, but when there are multiple ‘dees’, it means the bird is stressed or senses danger. It seems whenever I am refilling the feeder, our resident Western Chickadee fires off a dozen or more, while insisting on grabbing yet one more seed even as I’m lowering it to the ground. Then it waits indignantly for the whole procedure to be completed while bombarding me with ‘dees’ as though from a miniature ray gun. ‘Three Amigos’, watercolour by Lance Weisser, 5″ x 7″, Saunders Waterford 90 lb Hot Press Paper, sold. Pinantan Lake is about twenty minutes from Kamloops, British Columbia, where we live. It is a small community spread around the little lake’s perimeter and prides itself on being independent, artistic, and avant garde. Although this painting is not of an actual barn or photographed scene, it attempts to capture the spirit of what the area looks like under a snowy mantle when viewed from the road leading towards the lake. I’ve done it from my collective memory, rather than choosing to make use of photographs or while on location. It is snowing again, and is likely to continue through today and tonight and into tomorrow. As my friend Shiela says, snow today is water tomorrow, meaning we live in a characteristically arid part of British Columbia (our backyard mountain ridge has many cacti plants) and so every source of water is cherished. The snowmelt from the mountains is crucial to ensuring our lifeline, the Thompson River, is of normal size. Around here, many people kind of roll their eyes and sigh when learning we’re getting another ‘dumping’, but I’ve always delighted in snow and can now sadly envision a day when there won’t be any. Our living situation is such that I can handle clearing the driveway without much effort, otherwise I might be joining one of the eye-rolling crowd. The painting for my friend Patricia Kellogg is taking shape. The treated surface of the mat board I’m using to paint on was/is achieved by applying a product by Daniel Smith called ‘watercolor ground’. It comes in a jar and is painted onto any surface one desires, instantly turning it–once allowed to thoroughly dry–into one which can be painted on using transparent watercolour. So, glass, metal, wood, masonite, anything of the kind can basically become a surface with the characteristics of watercolour paper. My watercolourist friend Patricia Kellogg [https://www.facebook.com/Patricia-A-Kellogg-357357001050096/] and I are doing a painting exchange. I acquired one of hers of an artichoke plant in late autumn–that expressive form plants take when frost renders them lifeless, yet beautiful even so. And because she has a couple of mine with ravens in them, she wanted one more and so here’s the first stage of it. The surface for this painting is treated mat board and the medium is transparent watercolour. It is a 9″ x 12″ piece. Once it is finished I will enjoy taking it over to The Red Beard Cafe where we have our monthly coffee and seeing if she likes it. I’ll also bring a couple of others with me to provide a choice. 3) If there is a cluster of berries hanging from the tip of a long branch that only a single bird can reach, sometimes the rest of the group will line up and pass berries beak-to-beak down the line allowing each bird the opportunity to feed. 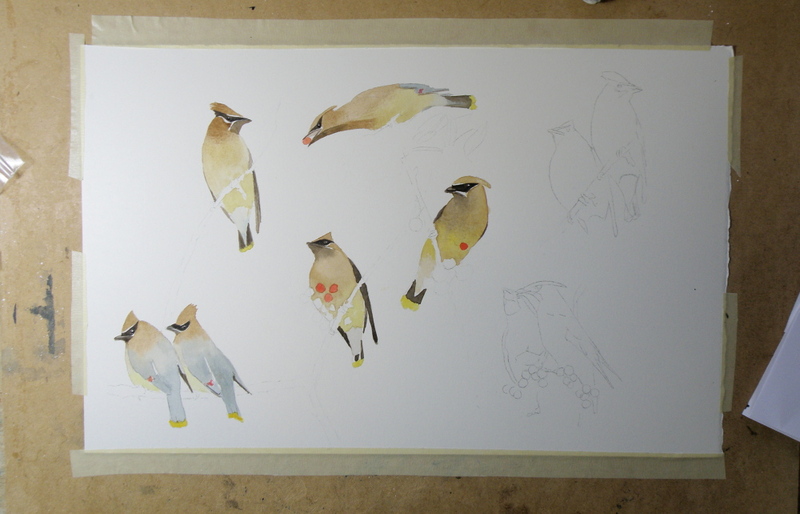 Cedar Waxwing watercolour-in-progress, Saunders Waterford Hot Press Paper 140 lb. As a child there was probably no bird I wished more to see than a Waxwing. In on-location photographs they just looked so exotic and intriguing–their colouration and little tufted crowns–the whole package was and is so appealing. In those days we lived in Eastern N. America where Waxwings aren’t found and so it took many decades–after I’d moved to British Columbia–for my chance to encounter these birds. And it happened as I stood at our front picture window looking out at the Red Maple just beyond the glass–a tree which had nestled within it a deserted Robin’s nest. Suddenly there appeared a large group of birds I’d never before seen, Cedar Waxwings, darting about the nest, examining it animatedly and calling to one another. I watched in fascination as they systematically began dismantling this Robin’s nest, their little bandit’s masks seeming very appropriate to their deciding to make someone else’s home theirs for the taking. ‘An Ear-full of Waxwings’ — work in progress — Saunders Waterford Hot Press Paper, 140 lb. A grouping of these birds is known as ‘an ear-full’ almost certainly because they go about in bunches and are constantly chattering in a distinctive, rather conversational voice that is more insistent than melodic or song-like, yet charming even so. In the spirit of watercolour experimentation, it was interesting to take ordinary white mat board and coat it with a thin layer of clear acrylic medium. The board then had to dry for a good 24 hours. The experience when painting is one of finding it acts as a kind of resist while providing a rather intriguing texturing quality. It is a bit tricky because there’s no wet-in-wet opportunity, or much reworking/touching up or the acrylic medium will moisten and lift from the surface and become gummy. So getting one crack at it is pretty much all one gets, making every brushstroke really count. ‘Steller’s Jay’, watercolour on Saunders Waterford Hot Press 90 lb., 4″ x 6″, Sold. When we moved from Quebec to British Columbia and went camping, it was startling to hear this loud, rasping, strident taunting from high in the trees. Startling, because it was so like a Blue Jay, yet not–like a Blue Jay with the flu. And then this amazingly blue-black jay bounded down to the ground, looking up at us as though wondering why we were occupying its picnic table. After returning from swimming, we found three of them pulling at the packaging of wrapped food and helping themselves to whatever they managed to expose. These are Blue Jays on steroids. But wow–how beautiful, how handsome, yes? When taking our Jeep in for servicing, the attendant came to me with what had been an air filter and was now a chipmunk house. I instantly knew which one–the one which seemed to be everywhere as late Summer progressed and Autumn loomed. The Least Chipmunk is so named because it is the smallest in our continent and can easily turn an air filter into a roomy apartment. It, like all its kind, eats just about anything, including insects, nuts, berries, mushrooms, and tree buds. The Least is so small a full grown adult weighs only two ounces. There are plenty of predators in our area, including many hawks, coyotes, owls and rattlesnakes. There are also a variety of potential homes, including Jeep air filters. Jays have two possibles–a ‘scold’, or a ‘play’–and given their feisty nature, both can be true at once. Here in Western Canada we have the Steller Jay, as well as the Whisky Jack or Grey Jay. Eastern Canada is home to the more familiar Blue Jay. “A Play of Jays”, watercolour by Lance Weisser, 8″ x 30″, 140 lb. Saunders Waterford Hot Press Paper. Sold. As a kid, having to enter the annual Science Fairs in Jr. High–the ones where invited experts walked around with clipboards trying to find possible prize winners–I had exhibits which were often concerned with birds–songbirds, usually–their migration patterns and predators, and fun facts. I never won a prize. That usually went to kids who electrocuted themselves voluntarily in order to prove water and wires don’t mix–or the kids who cross fertilized seeds and created vegetative freaks. The shortlist I had then in the 50s (living in upper New York State) was to see any kind of Bunting (they looked outrageously colourful), our State Bird the American Bluebird (which I never did see, and still haven’t), any kind of Tanager, and of course, any kind of Waxwing. Having lived now in seven different Canadian locations, from coast to coast, I’ve been able to photograph a Western Tanager in our front garden, a pair of Mountain Bluebirds (astonishingly blue), and a group of Cedar Waxwings which descended on our Red Maple branches and began dismantling a Robin’s nest, rather than having to bother scavenging their own material. The Waxwings were much smaller than expected, and every bit as fascinating as I’d hoped. Their ‘bandit’s mask’ gives them an allure other birds lack, and their interesting ‘song’ and penchant for travelling about in flocks makes them worth having to wait 60 years to see them. This Winter along with the usual Mountain Chickadees at our feeders, we were pleased to have Black-Capped Chickadees as well. Coming from Eastern parts, they are the ones associated with childhood and so have a special place for me. Right now we are experiencing amazingly warm temperatures–85F (30C)–and gardening is ramped up as a result. Dividing time between perennials and painting is a pleasure. As an Autumn and Winter person, I continue painting with that pallet of tones and colourations, and so ask you to cut some slack if/when I post snow scenes in April. The Black-Capped Chickadee hides seeds and other food items to eat later. Each item is placed in a different spot and the chickadee can remember thousands of hiding places. Every autumn Black-capped Chickadees allow brain neurons containing old information to die, replacing them with new neurons so they can adapt to changes in their social flocks and environment even with their tiny brains. Chickadee calls are complex and language-like, communicating information on identity and recognition of other flocks as well as predator alarms and contact calls. The more dee notes in a chickadee-dee-deecall, the higher the threat level. Winter flocks with chickadees serving as the nucleus contain mated chickadee pairs and nonbreeders, but generally not the offspring of the adult pairs within that flock. Other species that associate with chickadee flocks include nuthatches, woodpeckers, kinglets, creepers, warblers and vireos. Most birds that associate with chickadee flocks respond to chickadee alarm calls, even when their own species doesn’t have a similar alarm call. There is a dominance hierarchy within flocks. Some birds are “winter floaters” that don’t belong to a single flock—these individuals may have a different rank within each flock they spend time in. Even when temperatures are far below zero, chickadees virtually always sleep in their own individual cavities. In rotten wood, they can excavate nesting and roosting holes entirely on their own. Because small songbirds migrating through an unfamiliar area often associate with chickadee flocks, watching and listening for chickadee flocks during spring and fall can often alert birders to the presence of interesting migrants. The oldest known wild Black-capped Chickadee was at least 11 years, 6 months old when it was recaptured and re-released during banding operations in Minnesota. It is so heartening to have requests from bloggers and site visitors who have arranged to have original bird miniature paintings sent to them. The last posting of the Raven miniature, “Keeping Watch”, is currently winging its way to Hawaii, and the March 5th miniature entitled “Raven Moon” is sitting on Byron’s desk in Wisconsin. Another of a wintering Chickadee is with its new owner, Cynthia the poet, https://littleoldladywho.net/ in Maine. Some bird species are seemingly germain to just about anywhere, the House Finch being one. When we moved from Eastern Canada to extreme Western Canada, there they were. And on fellow blogging sites like H. J. Ruiz’ Avian 101 (https://avian101.wordpress.com/), there they are in the Peach State of Georgia. They are, along with wintering Goldfinches, the most frequent visitor to our feeders, and have such a delightfully melodious song. Unlike the slightly larger Purple Finch which probably isn’t found in the West, they do not so much look like they’ve been dipped in raspberry concentrate, as they’ve stuck their heads in wild cherry cream soda. Their disposition is mild, insofar as they aren’t pushy or argumentative when at the feeders. If another species is bossy, they simply flit down to the snow and eat the remains below, along with the Juncos. If you are ever interested in owning one of these posted bird miniatures, simply email me at: weisserlance@gmail.com and we’ll work out the arrangements. Thank you to all who are so very supportive in comments and visits! Our little Gallery in the small city of Kamloops, B. C.’s historic Courthouse (1911) has a Featured Artist offering every month and May will be my month to put on a display of recent miniatures. So now it is a matter of working towards having a good showing. I can’t quite explain why it is that depictions of Ravens sell so well, but they do. So it is a pleasure to be able to comply and feed the need, so to speak. They are indeed a very symbolic and ancient bird whose fame is heralded in many countries and cultural legends concerning them abound. Out taking photographs of them this week, I came across a pair whose size was truly astonishing and whose throaty calls echoed off the nearby boulders and across the wide Thompson River. Once that is accomplished, it is a matter of trying to place them in a scene which has definite mood and emotional impact. Teresa Robeson reminded me of ‘bird day’ (https://wordpress.com/read/feeds/4736591/posts/949345080#comments) with her striking rendition of an exotic Araripe Manakin from Brazil. Here is a far more humble (don’t tell it that!) species, but at least I’m doing my birdy duty this Tuesday morning….. I saw my first one two weeks ago–around the third week of February–which is so early for this region, it is nuts. When they get here, they go for Mountain Ash berries and other withering, over-wintered types of fruit, until their usual fare of insects and worms become accessible. They are in breeding mode preoccupied with all their parental preparations. It has been an unsettlingly warm Winter here in interior British Columbia, with Spring bulbs actually starting to poke up through the ground. Unsettling, because being only mid-Winter, we might well suddenly get one of those Arctic inflows and see temps plunge to -20C, which would effectively ruin what shouldn’t have already begun sprouting, including fruit trees. It wouldn’t be surprising at all to actually see Robins returning in February, when their normal return isn’t until mid-March. Being such avid worm-hunters, I have wondered at their early returns here, particularly as to what they find to eat. The answer is the Mountain Ash berry and other lingering berries. The danger, apparently, is eating ones which have fermented, thereby becoming naturally alcoholic and responsible for killing birds who eat too many. This miniature is of the British/European Robin, which doesn’t reside in Canada. But English Robin miniatures are snapped up in our Gallery simply because they have established such a rich literary following, and also appeal to Canadian emigres. The difficulty painting a bird the painter has never seen–and therefore isn’t familiar with–means it may not be true to how the bird actually looks. However, this particular bird has so frequently been depicted in book illustrations and greeting cards, that its persona lives beyond its ‘real life’ comings and goings. So here in Canada, getting the English Robin ‘right’ isn’t as stringent a matter as getting the Canadian Robin right–a bird everyone is familiar with, and therefore has to be flawlessly rendered. They seem so very sweet.